A tableau of thank you letters written by our school children paired with the artifacts that they mentioned in their letters. Together they testify that our Education Support Team is “Making history come alive for the youngsters of Delaware County”. 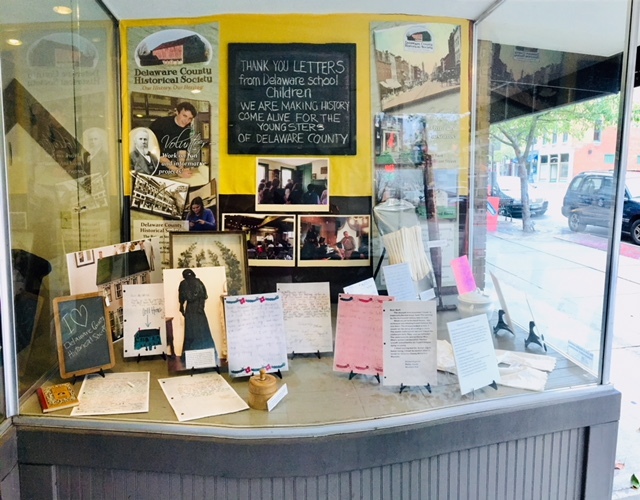 The thank you letters in the display are from Tyler Run, Wyandotte Run, and Arrowhead Schools (all in Olentangy school district) however they reflect the many letters students have presented. 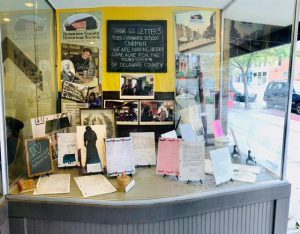 The letters displayed are from former students. 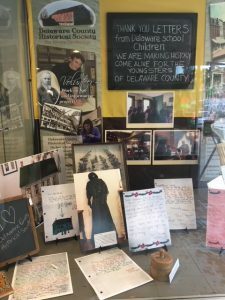 The Hair Studio at 33 North Sandusky Street in Downtown Delaware Ohio has graciously made their window available the Society for several years. For more information about The Hair Studio, for a map and directions click here. Learn more about Education Curriculum Support on our webpage which features a lively video.